When Buster Keaton joined MGM in 1928, he rented a bungalow near, but off site from, the MGM campus, infuriating studio head Louis B. Mayer, as Keaton was (one of) the only star(s) to rent space off of the lot. To rectify this, in 1930 or so MGM built Keaton a personal dressing room on the MGM lot, with living space and private kitchen, jokingly dubbed Keaton’s Kennel. My earlier post identifies exactly where the Kennel stood on the MGM lot, not far from the New York backlot set where Keaton filmed scenes from The Cameraman (1928) and Sidewalks of New York (1931). But where was Keaton’s original bungalow off campus? He writes at page 214 of My Wonderful World of Slapstick that it was located where the Irving Thalberg Memorial Building now stands in Culver City, which places it on former Grant Avenue. Studying vintage maps and aerial photos, there were only a few candidate homes. Somehow I came across these fun photos I had seen years before, Buster posing before a wide angle camera lens to create a series of distorted, attention-grabbing images. I then found a photo of him posing with director Edward Sedgwick, and realized that the background street in each image looked familiar. As confirmed by the Sanborn fire insurance maps and these aerial views, Keaton staged all four photos adjacent to MGM looking east down Grant Avenue towards the distinctive tiled roof of the Noice and Son funeral parlor at the corner of Madison and Grant. 1933 view south of Grant Avenue, showing the funeral home (red) and lawn where Keaton posed (yellow). A closer study shows Keaton posed for all four photos in front of the center home, a duplex actually, with the address 10132 – 10132-1/2 Grant Avenue. Given there were so few other candidate homes available, it seems most likely Keaton would only pose in front of the place he was actually renting. Given Keaton is wearing a similar short sleeve shirt, and the picture codes for the wide view shots and these radio poses all seem to begin with “MCMP,” I think it likely Buster took these above interior shots inside the same Grant Avenue bungalow, all as part of the same publicity shoot. Notice the plain curtains, fancy light fixture, and flowery wallpaper. 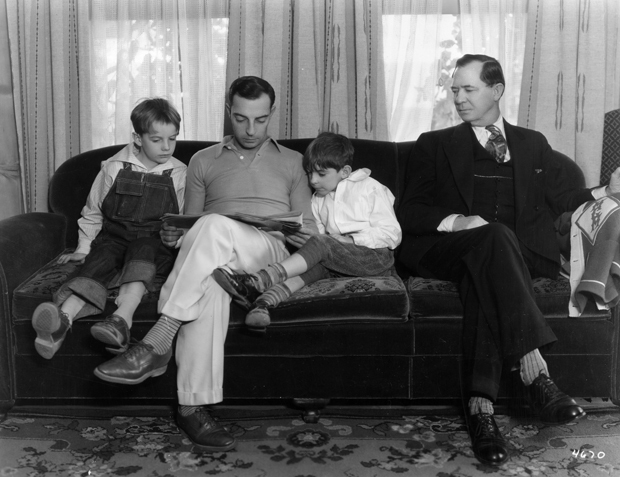 This photo of Buster (wearing long sleeves) with his sons and his father Joe was taken inside the Kennel on the MGM lot – the picture codes of Buster and his sons posing outside of the Kennel (4673, 4675) match the code for this interior view (4670), as do their clothes. The curtains here are not plain, and there appears to be no wallpaper. As such, I believe the above radio photos above were not taken inside the Kennel. Below, a matching view east along what was once Grant Avenue, taken in front of the Thalberg Building entrance. This entry was posted in Buster Keaton, Keaton Studio and tagged Buster Keaton, Culver City, Goldwyn Studio, Grant Avenue, Irving Thalberg Memorial Building, Keaton's Kennel, MGM. Bookmark the permalink. Excellent post as always, John! Harold Goodwin recalled in 1977 that the other two bungalows next to Buster’s were rented by two other MGM stars – Lew Cody had one, William Haines the other, dispelling the notion in some Keaton biographies that Buster was the sole offsite “rebel” among MGM’s employees. Thanks Ed. That all makes sense. Maybe the owners of these bungalows had a connection, or special sales pitch, for maverick MGM stars.